Over 100 volunteers packed into the gym at Portsmouth’s Cornerstone Church for on one of three food packing sessions to aid Feed My Starving Children. Rylie McQuithy, 10, was an enthusiastic food scooper Saturday morning at Cornerstone Church. Rylie had to stand on a step stool in order to reach the foodstuffs being packaged. Flanked by Tiffany Penson, one of several FMSC staffers on hand Saturday, Cornerstone Pastor Tim Roth, complete with hair net, talks to his gathered volunteers. Rylie McQuithy, 10, wasn’t shy about completing the tasks in front of her Saturday at Cornerstone United Methodist Church in Portsmouth. She was a little more hesitant in talking to a newspaper reporter. For the first of two packing sessions held that day, easily a hundred or more volunteers joined Rylie to help pack 179 boxes containing 38,600 plus meals which FMSC will send to over 60 countries. The prepackaged meals represented enough food to feed 115 kids one meal a day for a year. “That’s 115 lives you’ve changed for an entire year,” FMSC’s Tiffany Penson told the volunteers after their two-hour shift of packing vitamin powder, small scoops of dried vegetables along with cups of soybeans and rice into 13-ounce plastic bags labeled Manna Packs. Penson didn’t say so but that 115 number logically did not include persons such as the mothers she mentioned who will get to spend at least one day not worrying about how to feed their children. This is the third year in a row Cornerstone has sponsored what FMSC staff refers to as a mobile pack, said Cornerstone Pastor Tim Roth, who brought the program to Portsmouth after viewing a video of an event at another church run by a friend. While the packing session may have looked and sounded a bit chaotic, activities are pretty well organized by FMSC staffers on site. Penson talked about transforming the gym into an FDA approved food packing facility for the afternoon. With that in mind, volunteers all were required to wear hairnets, wash their hands and use gloves if they were handling food. No jewelry was permitted as it conceivably could fall unnoticed into food. Volunteers gathered around tables set up in U shapes in Cornerstone’s gym. Two persons wearing plastic gloves scooped the contents of the meal packs into a sort of metal funnel. Other volunteers opened plastic bags to catch the foodstuffs coming out of the funnel. The goal was to get each pack to weigh around 400 grams. Other volunteers would use a sort of package sealer to close the packs which were then set aside for careful boxing. According to FMSC’s staff, when cooked each bag contains enough food for six meals. Penson said one reason the organization uses rice is pretty much everybody knows how to make rice. She added staffers have cooked up some of the concoction at other mobile events and at previous Cornerstone events. A repeat volunteer, Dr. Kimberly Umhoefer said the mixture tastes a bit like mushy rice pilaf. For her part, Penson said that was a pretty apt description. While dishing out vitamin mixture and dried veggies, Rylie said she would not really like to sample the food she was helping prepare. Asked what she would send instead, Rylie, surprisingly stated “broccoli.” Helping seal bags, Xavian Chambers, 9, and part of a visiting 4-H group from Lucasville, gave what seemed to be a more predictable response. Xavian said he would gladly send pizza. Like Rylie, Xavian said he was having fun at the packing event. Most of the adults in the room seemed to be having fun as well. Music of all types played in the background. (Rylie gave thumbs up to Imagine Dragons but wasn’t so sure about the Beatles.) Volunteers urged each other on and shouted when they had enough bags to fill a box or needed refills of any materials. Penson a couple of times urged volunteers on by challenging them to pack so many bags in short periods of time. 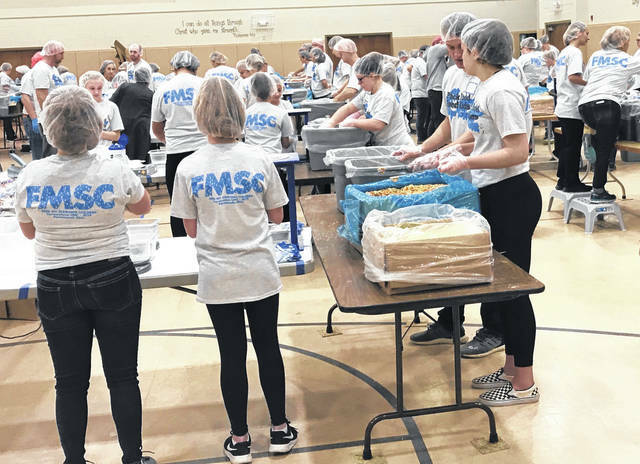 By the end of a second packing session slated for Saturday afternoon, Roth figured Cornerstone will have affected the lives of 960 kids having packed some 375,000 meals over the three years Cornerstone has hosted FMSC. For the weekend, which included a Friday mobile pack, over 500 Cornerstone volunteers packed 124,000 meals that will feed 340 children for a year. Roth noted later when the event returns to Cornerstone in 2020, church volunteers will have reached a sort of milestone in having packed over 500,000 meals. Noting a belief Jesus Christ was sent to earth to serve, Roth puts an emphasis on service at Cornerstone. A banner in the church lobby advertises one major volunteer opportunity each month of the year. Roth’s personal favorite is Hope Fest, which sees the church hand out school supplies, new shoes and provide haircuts to hundreds of children around the area. Roth puts an emphasis on the fun and joy he firmly believes volunteers can experience at these events. “People think church is boring, it doesn’t have to be boring, not at all,” Roth said. https://www.portsmouth-dailytimes.com/wp-content/uploads/sites/28/2019/03/web1_crowd-shot-2.jpgOver 100 volunteers packed into the gym at Portsmouth’s Cornerstone Church for on one of three food packing sessions to aid Feed My Starving Children. 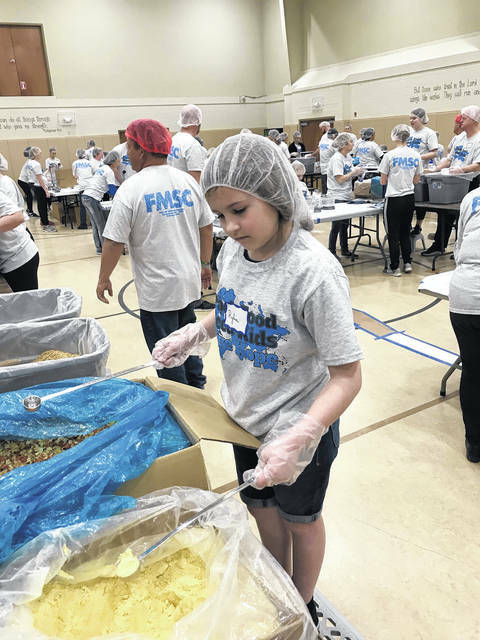 https://www.portsmouth-dailytimes.com/wp-content/uploads/sites/28/2019/03/web1_rylie.jpgRylie McQuithy, 10, was an enthusiastic food scooper Saturday morning at Cornerstone Church. Rylie had to stand on a step stool in order to reach the foodstuffs being packaged. 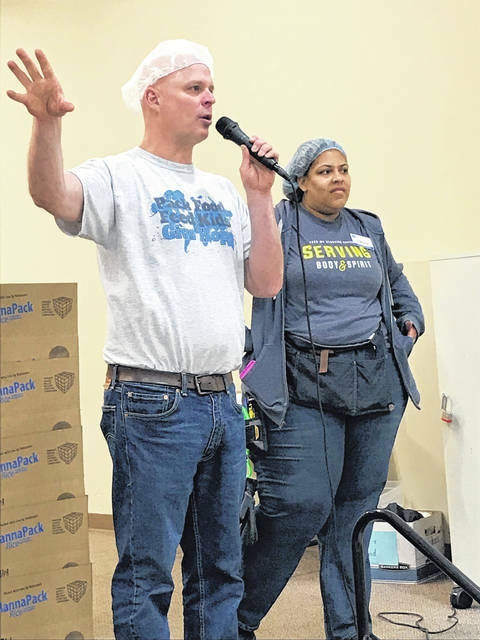 https://www.portsmouth-dailytimes.com/wp-content/uploads/sites/28/2019/03/web1_roth.jpgFlanked by Tiffany Penson, one of several FMSC staffers on hand Saturday, Cornerstone Pastor Tim Roth, complete with hair net, talks to his gathered volunteers.